Germany's Stefan Schumacher has been banned from cycling for two years after failing a drugs test during last year's Tour de France. Schumacher tested positive for advanced blood doping product Cera (Continuous Erythropoiesis Receptor Activator). The rider won two time trials at the 2008 Tour and held the overall leader's yellow jersey for two days. Schumacher was banned from competing in France for two years by French anti-doping authorities last month. International Cycling Union (UCI) president Pat McQuaid told a news conference: "Schumacher is now banned from activity from 22 January 2009 to 21 January 2011." But the 27-year-old Schumacher vowed to clear his name through the Court of Arbitration for Sport. "One thing is clear: I have not doped and I have nothing to hide," said Schumacher. 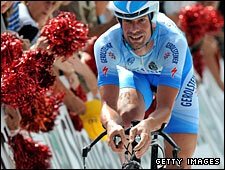 Italy's Leonardo Piepoli also tested positive for Cera at the 2008 Tour, and compatriot Riccardo Ricco has admitted using the substance which is a version of blood booster erythropoietin (EPO). The three riders won five of the 21 stages during the race last July between them. Austrian Bernhard Kohl, who won the King of the Mountains jersey as the best climber and was third overall, is another to have owned up to using Cera. This year's Tour of Germany was cancelled following the spate of failed drugs tests.